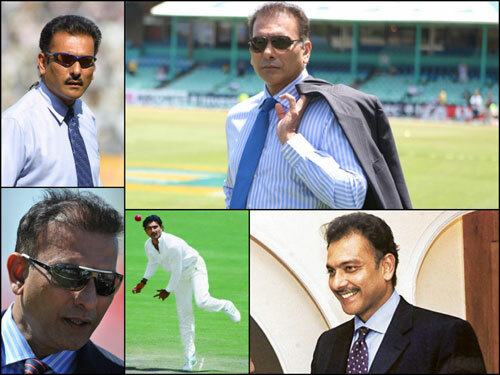 Ravishankar Jayadritha Shastri (born 27 May 1962) is a former Indian cricketer and captain. He was an all–rounder who batted right-handed and bowled left arm spin. His international career started when he was 18 years old and lasted for 12 years. He started his career purely as a bowler but gradually became more of a batsman who could bowl. As a batsman, he was essentially defensive with the “chapati shot” (a flick off the pads) being his trademark shot, but could raise his strike rate when required. Due to his above-average height (he stood 6′ 3″ tall) and an upright stance, he had a limited number of shots against fast bowling, but was able to put the lofted shot to good use against spin bowling. Shastri played either as an opening batsman or in the middle order. The highlight of his career was when he was elected the Champion of Champions in the World Championship of Cricket in Australia in 1985. In the same season, he equalled West Indian Garry Sobers’s record of hitting six sixes in an over in first class cricket. He was regarded as a potential captain, but his image outside cricket, injuries and tendency to lose form at crucial times meant that he captained India in only one Test match. In domestic cricket, he played for Bombay and led them to the Ranji Trophy title in his final year of playing. He also played four seasons of county cricket for Glamorgan. He was forced to retire aged 31 due to a recurring knee injury. He is now a noted TV cricket commentator.